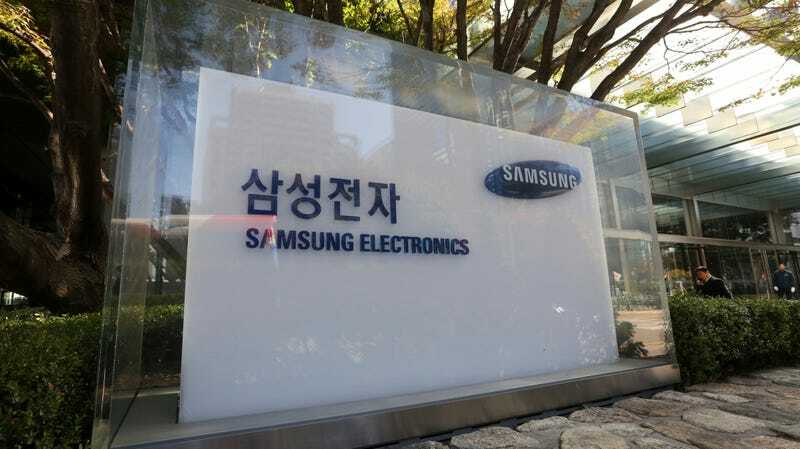 The logo of Samsung outside its Seoul, South Korea offices. Earlier this month, tech giant Apple posted quarterly revenue projections of just $84 billion, much lower than its previous projections of $89 to 94 billion, setting off a “flash crash” in global currency markets. According to a Monday report by Bloomberg, its South Korea-based rival Samsung also appears to be hitting a wall right now. Deteriorating relations between the U.S. and China — Samsung’s two biggest export destinations — has hit demand for memory used in everything from personal computers to mobile devices, raising the pressure on a company struggling to revitalize its smartphone business. One factor behind troubles at the company is the lower sales projections from Apple, a major Samsung memory and smartphone screen buyer—for which a wide variety of explanations have been proposed including the ongoing U.S.-China trade war, an associated slowdown in the Chinese economy, increasing competition in the phone market from emerging players like Huawei, and the fact that Apple products are prohibitively priced for some international markets. Samsung also acknowledged that its own smartphone business is struggling in a “stagnant and fiercely competitive market,” CNBC wrote.